← Marmab[ ]-[ ]th 3.0 / Special Greif Masters. Greif Masters 2, Team France on top of Europe. 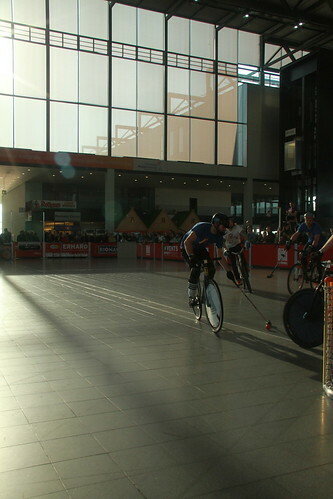 During the 4-5-6th of February, Karlsruhe hosted the second edition of The Greif Masters. This year, to prevent from doing an “invitational” tournament, our friends from Karlsruhe Bike Polo decided to organize an European Bench Minor tournament. The tournament was composed of 9 teams, Germany, England, Spain, Switzerland, Italy, Benelux, but also London (because they are the biggest bike polo community in Europe), Karlsruhe (because they were organizing it and wanted to play as well) and France. Each teams had to choose a captain and their best 10 players to represent their country (or city). The French team was composed by Greg (MGM), who also was the captain, Marmousou (MGM), Marc (Apologies), Luis (Apologies), Hugo (DTGP), Will, Jo and Polo (Call Me Daddy), Maks (Hooks) and Pierre Adrien (also known as Bidou, also know as Eugène) (Broken Legs). First round was a Round Robin and every team played against each others, at the end of the first round the 2 bests teams were qualified for the Final. Quickly, only 4 teams could claim to the Final: Germany, Spain, Switzerland and France. The first game between those 4 teams was Friday. Late afternoon, Germany was playing against Spain. At the end of a hotly contested game, team Spain finaly won 9-12. With this loose game Germany’s chances to reach the final got smaller. Whereas team Spain end their day ahead with 3 games and 3 victories. Team France began their tournament with 2 victories for their first 2 games against Karlsruhe 11-5 and against London 16-8. © Brendan McNamee, check his flickr here. For the first game of the Saturday, Team France (renamed the Alligators from their battle scream “10 alligators, 10 alligators ! OHAY OHAY!”) began, into the thick of it, with a decisif game against Germany. For team Germany, who already used their joker against team Spain the day before, another defeat and they won’t be able to reach the Final. In a really tight game where defending was the key, team France won on the gong 9-8 despite a massive pressure on their goals during the 2 last minutes from David and Mo from Polosynthese. Later in the day, a second team has seen her chances of reaching the Final fly away. At 7:14PM ends the game between Spain and France with a score of 10-9 for the alligators. During a very intense and engaged game, with some unappropriated moves sometimes borderline, team France managed to keep concentrated in the game to win against the team they feared the most. Team Spain ,defeated 2 game earlier by Switzerland, can no longer reach the Final. It’s now, for Switzerland and France, a matter of winning their games against “weakest” teams to save their place for the Final. Lasts games of saturday and sunday didn’t change anything for these two teams, nevertheless it allowed other teams to ensure their ranking. Team France ,who defeated Italy (15-4), Benelux (18-2), England (13-7) and Switzerland (12-7 in a game without stakes), finished first at the end of the Round Robin with 8 victories over 8 games, best attacking pressure and best defense. Here is a piece of the ranking after round robin (with 1 more game for France and Switzerland because of the final). Find out every results and ranking on the Greif Masters website. As our friends from Karlsruhe know how to make it right, they planned, just before the final, the game between London and Rest of England, the winner of this game ended 5th, the looser 6th. After a fun but also intense battle, team London won 15-12. For the Final, the game was 2x30mins whereas round robin games were 38mins long. Team Frane and team Switzerland reached the final with really different way of managing their teams. In one hand, Team Switzerland was really counting on l’Equipe line up (Mario, Lukas and Manu) and the Ponies line up (Clément, Quentin and Johann) and on the other hand team France was more “sharing” time between every players. After a really good start for the alligators 2-0, team Switzerland, with l’Equipe’s line up and the Ponies’s line up, scored 6 goals in a row making it 2-6. Hopefully at the end of half-time team France manage to reduce the gap 5-6. Second half was close, team Switzerland kept their advantage of goals for a long time but team France stayed on contact. This is when the management of team France really payed out. Changing players more often in team France prevent them from being to tired for the end of the game whereas team Switzerland was counting on few players who seemed quickly tired. Using this lack of energy and with a really strong defense and good accurancy with long shots, team France took advantage with 3 goals ahead and 7 minutes to go. By keeping this rotation they managed to hold on those 3 goals and won 13-10. 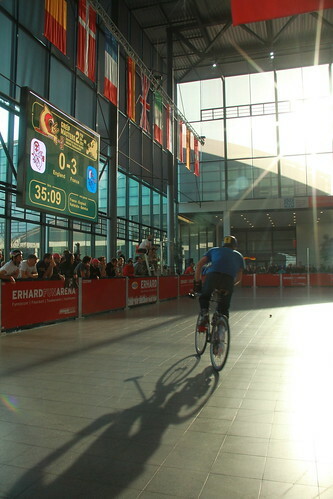 After this victory, France show a really strong bike polo scene even if her teams had never won a major European tournament before. Here are 2 videos, made by Chan and Brendan, showing the atmosphere of this amazing tournament.